All bungalows in Balchik, Bulgaria with prices, phones, photos, stars, descriptions, addresses and locations on the map. 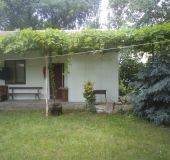 1 bungalows in Balchik. Locality Ikantalaka lies between Balichik and Kavarna. The beach - St. George is narrow, but very cozy sandy beach, located in the small cove surrounded on all sides by cliffs.